Diving is an activity that is not without risk; Even when practicing fun diving we are exposed, since it is a matter of working in a medium, for which the human being is not prepared. Surviving under water would be impossible without the proper recreational diving equipment. It is what stands between a hostile medium and our own body. Choosing it well according to the use that we are going to give it, as well as knowing how to handle it and maintain it properly can mean the difference between pleasurable dives or those that leave us with a bad taste, due to having suffered an accident or mishaps that we could have avoided. Also, why deny it, the process of selection and care of scuba diving equipment is an added incentive and fun to everything that surrounds this beautiful activity. Which diver does not like to spend hours and hours talking with other hobby colleagues about novelties in materials, reading specialized magazines, or visiting the dive shops, hunting for the best equipment and the most overwhelming offers in the market? We are going to do a review of all the basic elements necessary for our recreational diving dives. Before getting scared with the list of materials that we are going to describe, think that the vast majority of diving centers offer their customers a wide range of equipment for rent. If you decide to rent, it will allow you to forget about its maintenance, as well as to replace the wear parts. On the other hand, you will not have a diving equipment totally to your liking, and adapted to your particular needs. The idea is that little by little you have your own recreational diving equipment, as you discover what you like to do most, and as you try different options. The recommendation is that do not make very large investments in materials or equipment that you are not sure will fit you. 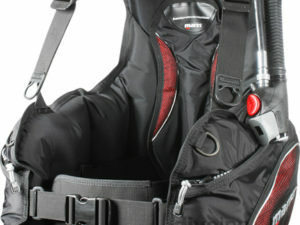 Having said that, in diving, two different groups of equipment are distinguished: light equipment, and heavy equipment. 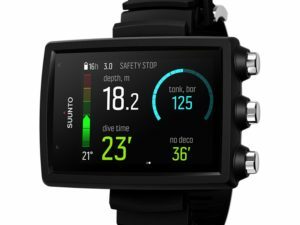 The first one is the one that groups the elements that a freediver can use, while the heavy equipment is the one that will complement it to allow you to dive under the surface. 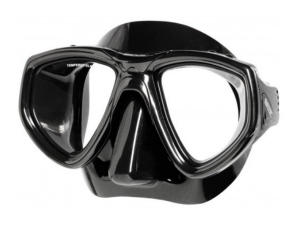 The mask is one of the most important elements of our scuba diving equipment. Scuba diving is about discovering the underwater world; the view is one of the senses that are going to delight, so a mask that suits our morphology is going to be crucial for us to enjoy this sport. There are many kind of masks or diving goggles; with more or less space between the glass and our eyes, with a crystal or two crystals, and with many types of silicone. The most important thing is that they have tempered glass (discard any mask that does not have tempered glass), and that both the silicone and the adjustment system, adjust to the morphology of our face. Fortunately, in any specialized store they have a wide variety; Choose the one with which you are comfortable. To do this, put the mask around your eyes and nose, without placing the adjustment tapes; press the crystals, and breathe gently through the nose; it will make a small windy effect; release the crystals. If the mask fits your face and you’re comfortable, it’s the mask for you. As in the masks, with the fins we have many options. There are two fundamental decisions to make. Anchoring system: there are two modalities; The fins of a closed shoe cover the entire foot, remaining inside the material of the fin itself. In contrast, the open heel, use a few straps and an anchoring system to fasten the foot. Although the open heel fit better to the foot, in most cases require the use of booties for proper adjustment. 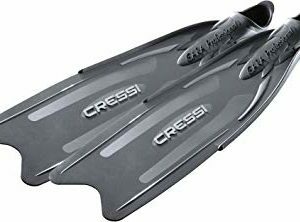 This is why they are also used more in cooler or deeper waters, while those of closed shoes are used more in snorkeling or diving in more tropical waters. Level of flexibility and size: a flexible fin will be easier to move under water, but it will also require more effort to travel long distances or faster; nevertheless, for fun diving, where comfort prevails, the use of flexible fins is recommended, while in other more technical modalities they may require more rigidity. As any element that has to do with the feet each manufacturer considers its own measures, so you should try them before acquiring them. Under the water it’s cold; Although it may seem that it is at a good temperature, staying under the surface for prolonged periods of time will make us lose a lot of body heat. To avoid the cold, the suit is essential. Neoprene thickness: the thicker, the more thermally insulated; We can select suits from 1 millimeter thick up to 7 millimeters as a general rule. 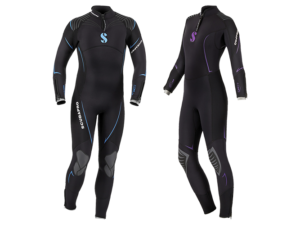 There are more thick wet suits, but they are quite uncomfortable and it is advisable to opt for another kind of suit. Type of suit: we can choose between wet, semi-dry, and dry. The first ones are totally permeable; we will get water, although the neoprene will take care of maintaining our body heat. The semi-dry will have elements in the main points of entry of water (cuffs, ankles, neck, and zipper), which will increase their tightness. Although they allow some water to pass, it does not enter as much as in wet suits, so the level of thermal insulation is higher. Finally, the dry ones even allow to go dressed inside the suit, since it will not enter any water. As you imagine, both the choice of thickness and the type of suit depends on how cold or hot the diver is. If it is a particularly cold diver, it is always advisable to complete the suit with hood and gloves; It is worth remembering that the head and hands are the parts of the body that lose more body heat. 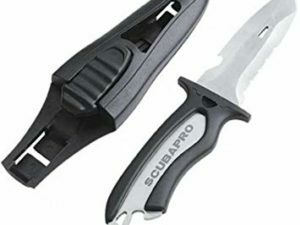 Although it is not mandatory, carry a simple knife on your light equipment and cut well, it can save a lot of trouble, both outside and inside the water. To close the chapter on light equipment, we must emphasize that its maintenance is simple; Simply rinse the equipment in fresh water after each dive and store it in dry and cool places. Perhaps one of the most personal elements for a diver; The buoyancy system is the vest that goes around our body. Hold the bottle, guide the regulator hoses, and allow us to carry other elements. But its fundamental mission is to hold air inside; its swollen or deflated will allow us to ascend, descend, or maintain a neutral buoyancy. Its size should be adequate to make us feel comfortable, and its capacity enough to guarantee that we can manage it to ascend or descend at speeds that do not put our health at risk. The vests are connected to our bottle, and have systems for inflation and deflation, depending on whether we want to lower or raise the level of depth. Knowing how it works and managing it properly will help us stay at the desired depth. For all this, it is important that the diver knows and manages the vest perfectly, being highly recommended to have one of its own, in order to avoid unwanted effects by using units with specifications or performance different from what we are used to. Every human body under water tends to float. Especially when we have air in the vest, or in our lungs. Because of this, the weight is fundamental; is what will allow to compensate that force that pulls towards the surface. 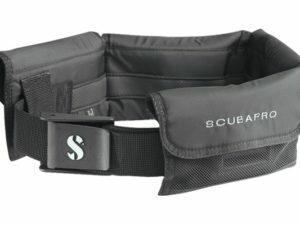 The weight belt is nothing more than weight that we add to the eqipment to counteract the natural buoyancy of our body and the rest of the equipment, and allow us to sink. It is essential that the weight belt is easily released, in the event that we have an emergency during our dive and we have to get rid of it. If there is something that you should not stop doing under water, it is breathing. The regulator is what will allow us to comply with this premise. The regulator puts the bottle, in which the air is stored, in contact with our organism. The regulators are composed of two stages or well differentiated parts: the first stage is the one that connects the bottle with the hoses; decompresses the air in the bottle, and makes it breathable. The second stage is the one that is placed in our mouth, and allows us to breathe on demand. The most usual is that we have in the diving equipment a first stage and two second stages, one main, and another emergency or security, in case we have problems with the first. 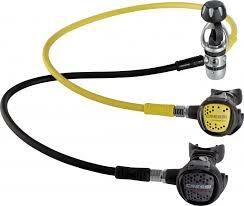 It is advisable to pay it a special attention because the regulator is one of the most important elements of scuba diving equipment. Aluminum or stainless steel, the scuba tanks or diving bottles are the ones that hold the air that we breathe under water. 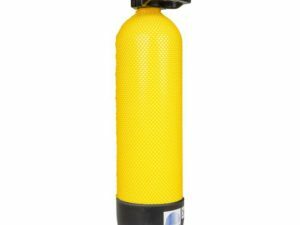 Normally it will be normal compressed air, but if we want to hold more time in certain depths, or do another type of diving, they can be filled with other mix of gases, such as air enriched with oxygen, or Nitrox. Normally, the tanks will be 12 or 15 liters capacity. For beginners who consume more air from the account, the use of 15 liters is recommended, although they are heavier. A good diving computer is a highly recommended element (and mandatory in some countries) in our scuba diving equipment. It will give us the reading of the basic elements of the dive. Most of the models have luminous and acoustic warnings in case some parameters go out of normal, such as ascent speed, background time, decompression entry, safety stop times, etc. All this makes it a life insurance for any diver, so it must be seriously considered as another element of heavy equipment. Unlike light equipment, which requires basic maintenance of cleaning with fresh water and good storage, heavy equipment will require its own maintenance, depending on the type of material and the manufacturer’s recommendations. Acquiring the heavy equipment entails the responsibility of attending to this maintenance, if we want that only joys in the practice of scuba diving.